We have optometrists who specialise in Ortho-K (Orthokeratology) at Zacks London Eye Clinic – Warren Street, Fitzrovia, London W1 . Ortho-K, also known as overnight vision correction (OVC) involves using specially designed rigid gas-permeable contact lenses to gently alter the shape of the cornea in order to reduce or correct myopia (short-sight). The aim of ortho-k is to be free of both contact lenses and spectacles during waking hours making it a viable alternative to refractive surgery. In the last few years, advances in technology have made it possible to accurately scan the cornea and manufacture ortho-k contact lenses which achieve a controlled and precise reduction in spectacle prescription. New developments in lens materials enable this to be done safely with overnight wear which is why the procedure is sometimes known as overnight vision correction (OVC). At Zacks London eye clinic, ortho-k, overnight vision correction has become so popular that it now constitutes a large part of our clinical time. We achieve excellent results with myopic prescriptions up to -5.00 and sometimes it is possible to correct higher prescriptions. Most of the visual changes with overnight vision correction treatment occur rapidly in the first few days requiring frequent examinations and in some cases, progressive lens changes. Stabilisation follows at a slower pace over the next few weeks. The cornea is highly elastic, however and always eventually returns to its original shape. For this reason, retainer lenses are necessary to maintain the improvement in vision. They are usually worn overnight after the ideal corneal shape has been achieved. Children can be treated effectively and there is strong evidence that increasing myopia (short sight) is retarded (myopia control). Ortho-k is modifiable and reversible meaning that changes in prescription can be easily dealt with, or treatment can be halted. Over night vision correction does not hurt. Ortho-k works well for dry eye patients as they are free from contact lenses during the day. Ortho-K is not a permanent solution or a cure and is reversible. Overnight vision correction requires long term maintenance, with strict hygiene and regular aftercare appointments (usually every 6 months following the initial treatment when the contact lenses need to be replaced). The refractive error correctable by OrthoK is limited (usually to -6.00). The corneal response to Ortho-k gentle moulding procedure, shows individual variance and is not always predictable. During the initial stage of Orthok treatment, the effect is progressive so vision correction will be variable and daily disposable contact lenses may be required. Ortho-K, overnight vision correction is not suitable for patients with ocular surface disease, keratoconus or corneal dystrophies. 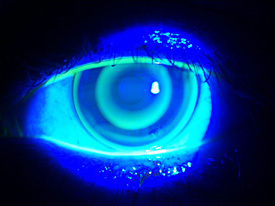 As with any contact lens wear there is a small risk of infection, allergy and corneal erosions. If you are interested in trying Ortho-K, overnight vision correction please contact us to make an appointment for a consultation at our central London practice.